I like to cut my own beef cubes from a chuck roast, it gives me control over the size of the pieces and allows me to trim exactly what I want. 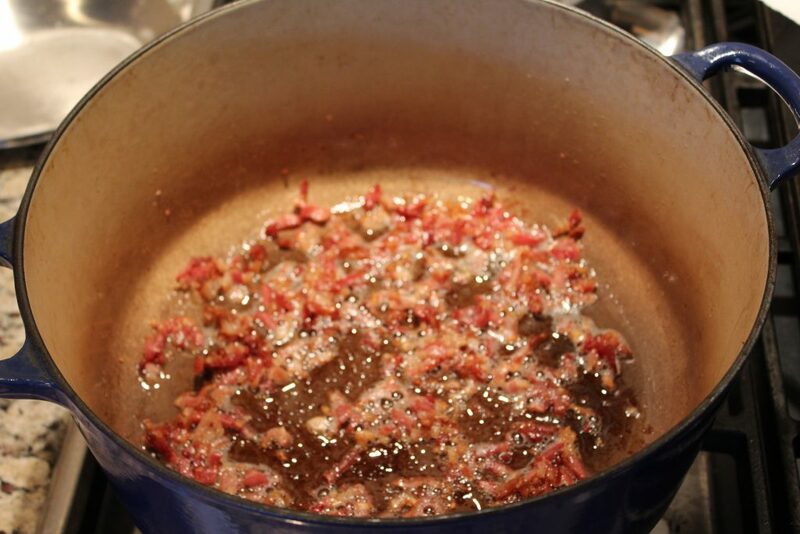 Start with a little bacon – it adds flavor to the dish and is a great fat to brown the beef in. 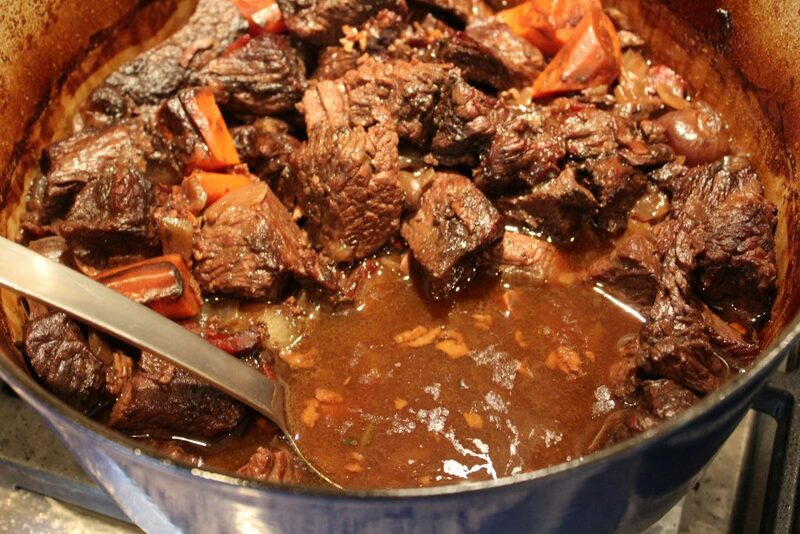 I don’t flour my beef cubes, I like to thicken at the end. I feel you get better browning (flavor) without that layer of flour on the beef cubes. 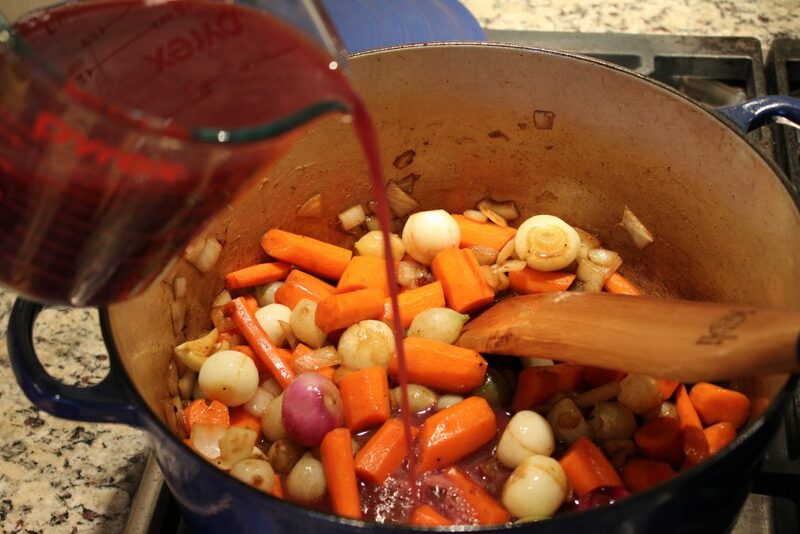 Red Wine – Red wine plus some low-sodium beef stock are my liquids of choice. They really add tons of flavor. I don’t care for potatoes in my stew, I much prefer serving with creamy rich mashed potatoes or soft polenta. Double Onions: Chopped onions almost melt into the stew and the pearl onions become soft little pearls of flavor. 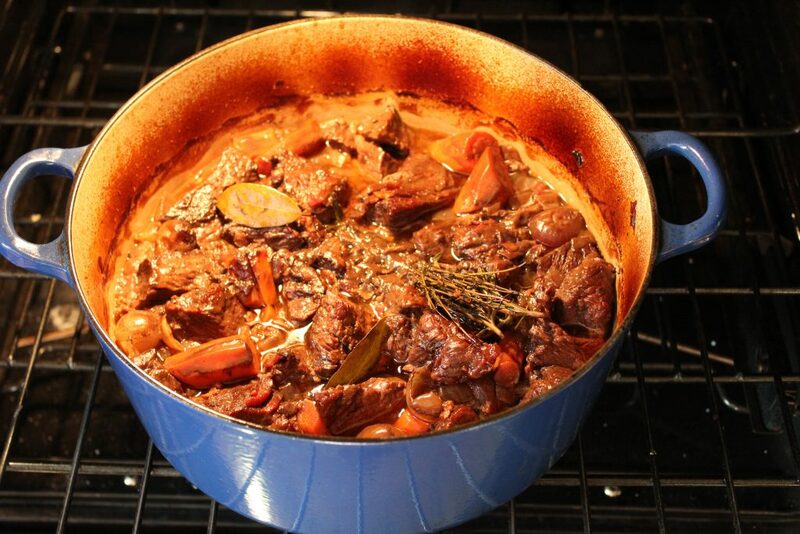 Braise in the Oven: Cooking in the oven gives you even heat that penetrates the pan from all sides. 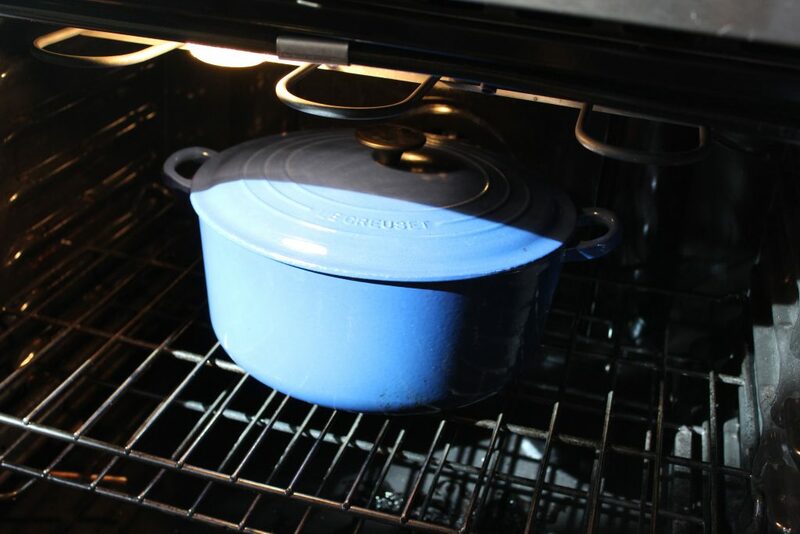 I like to use a nice heavy cast iron dutch oven with a oven safe lid. 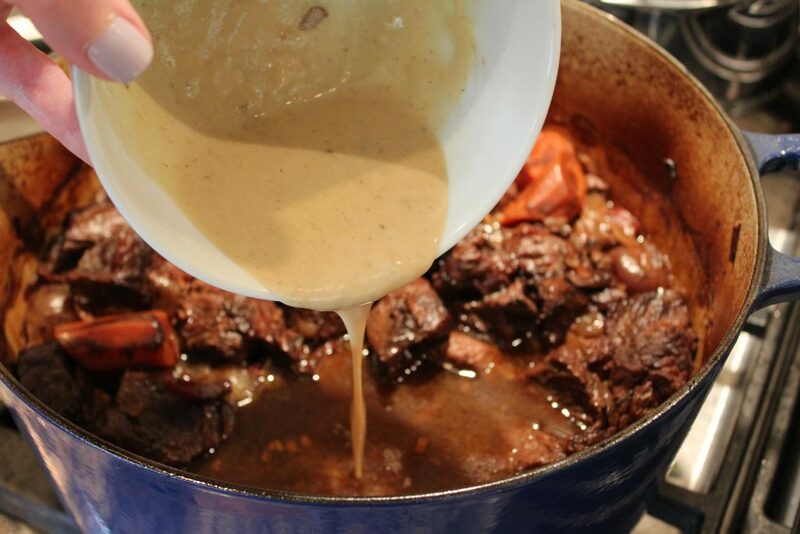 The pieces of beef above the liquid level get the most beautiful brown carmelization from the slow oven roasting. Peas? Sometimes I add them to the stew right at the end, sometimes I serve them on the side. I usually make a large batch of stew and freeze half. I don’t feel as though the peas look as nice once they’re frozen and reheated. Thicken: I like to thicken my stew at the end of the cooking process. I make a paste of soft butter and flour and add it until it’s as thick as I want. Turns out this is called beurre manié in French and means “kneaded butter.” The flour particles get coated with butter helping them to not clump together, giving you a nice smooth sauce. Can I make this is my slow cooker or pressure cooker? I have done both, but feel you get the best flavor from the slow oven roasting. You don’t really get all that caramelized goodness in a slow cooker or pressure cooker. Make ahead! This is a great dish to make ahead. You can make up to 3 days in advance and reheat. It also freezes beautifully. I usually freeze half and can make 2 meals for our family of 4 from one batch of stew. 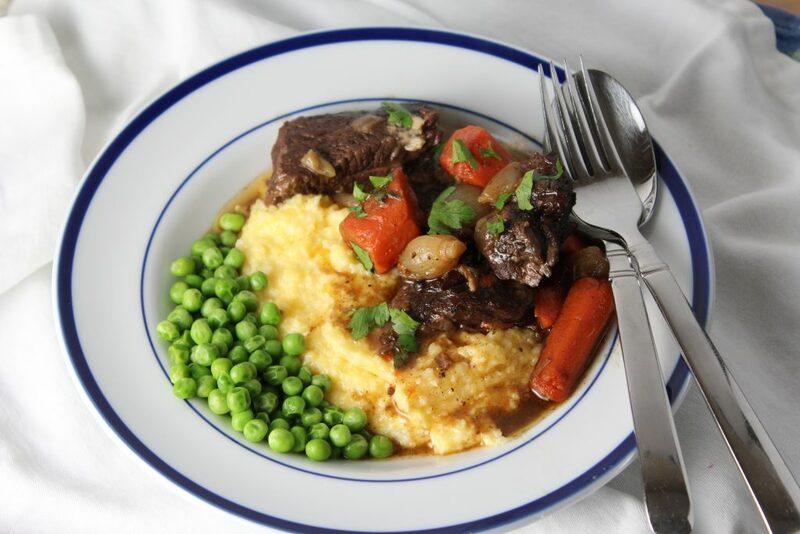 We love our stew with creamy mashed potatoes or soft buttery polenta! I usually serve the peas on the side. Fresh out of the oven, look at all that beautiful rich caramelization! 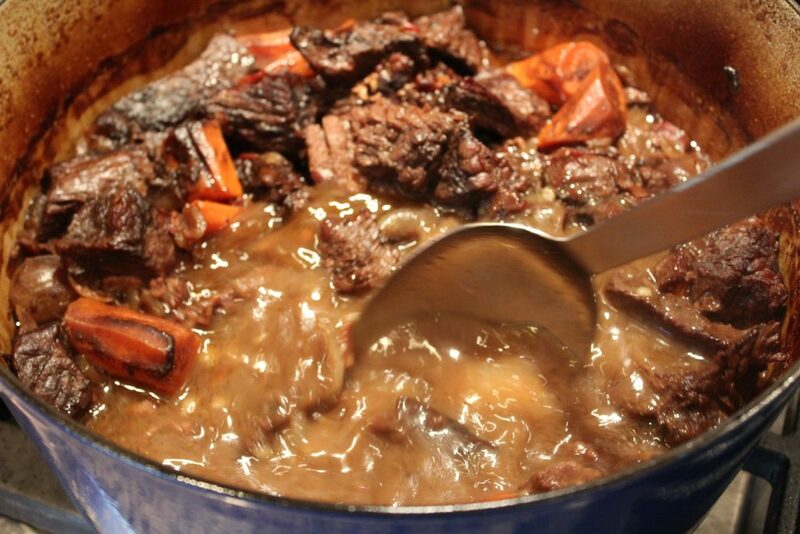 Beef stew seems like an easy enough dish to "get right", but it took me years to figure out how to make a truly flavorful and tender beef stew that my whole family loves! 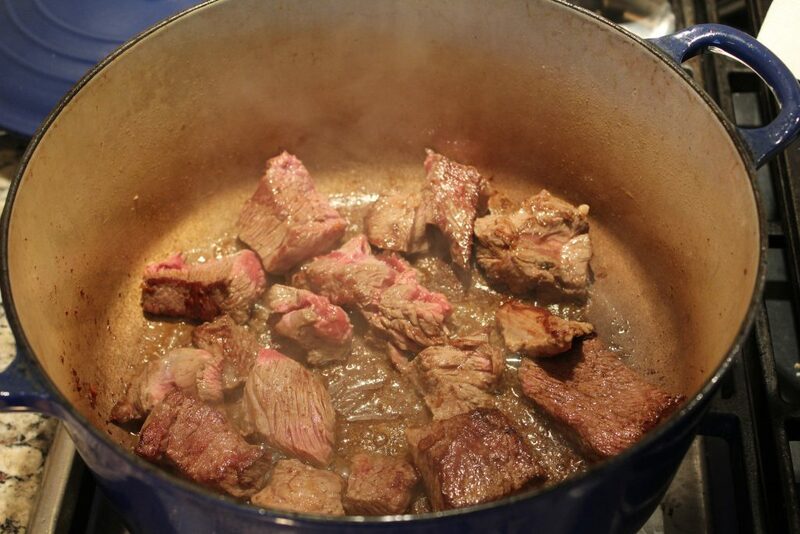 Season the beef chunks with 1/2 teaspoon salt and 1/2 teaspoon pepper. Brown over medium-high heat in batches. Remove to platter. Lower heat to medium and add chopped onion, pearl onions, carrot and garlic. If pan seems too dry, add 1 tablespoon oil. Sauté for about 3 minutes. Deglaze pan with the wine, scraping up bits from bottom of pan. Bring to simmer. Add broth and soy sauce to mixture. Add the beef back to the pot. 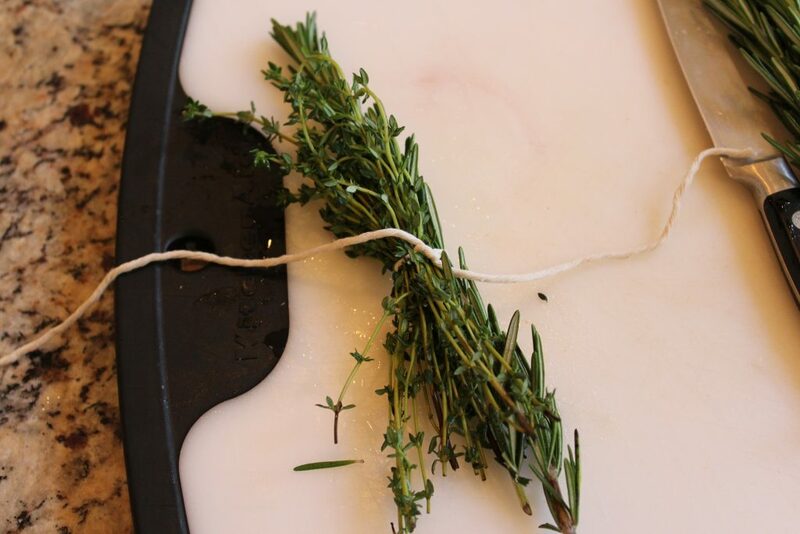 Use cotton kitchen string* to tie the rosemary and thyme sprigs into a bundle that will be easy to remove later. 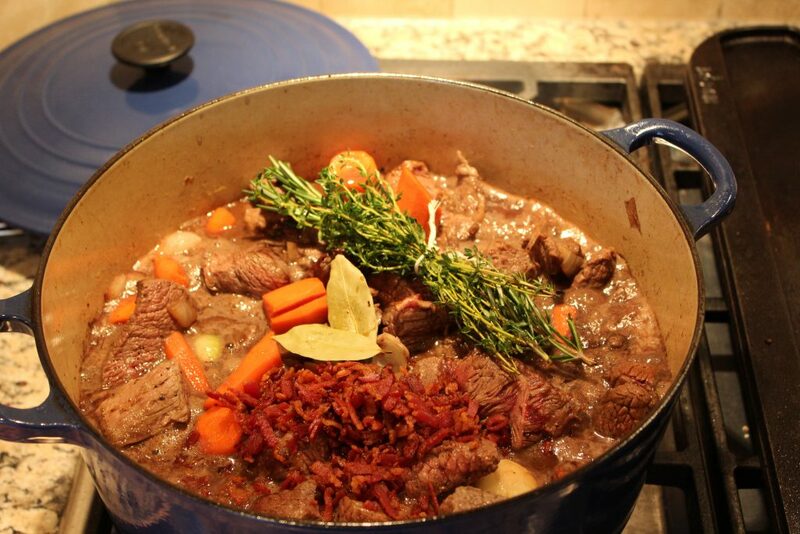 Add the herb bundle, bay leaves and bacon to the pot. Cover pot with lid and place in oven to braise for 75 minutes - 2 hours. You know it's done when the beef chunks can be easily pulled apart with a fork. Remove herb bundle and bay leaves. 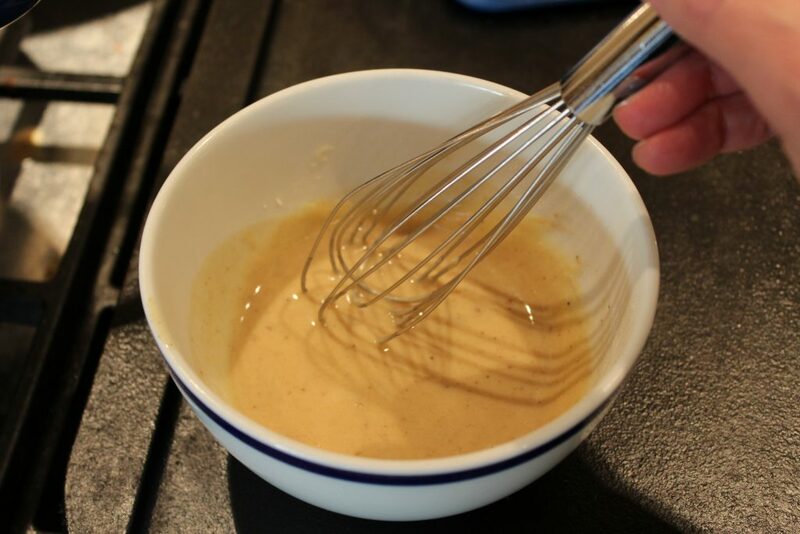 To thicken the sauce, make a paste of butter and flour. (I use 2 tablespoons butter and flour, if you like a thicker stew, you can use 3 tablespoons butter and flour.) 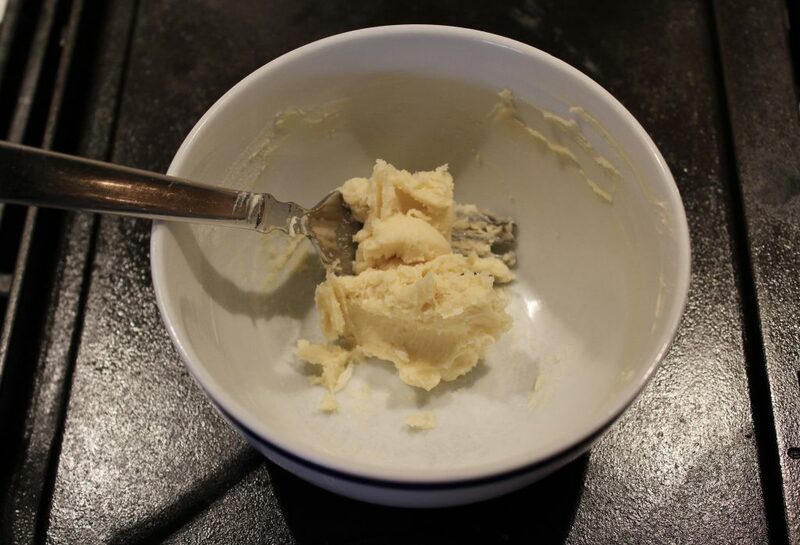 In a small bowl mash together softened butter and flour with a fork to form a paste. 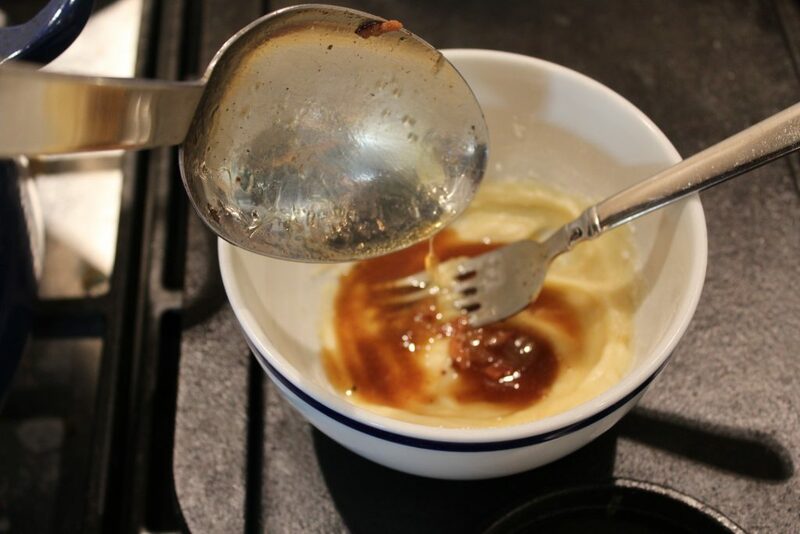 Spoon a few tablespoons liquid from stew into the paste and stir until smooth. 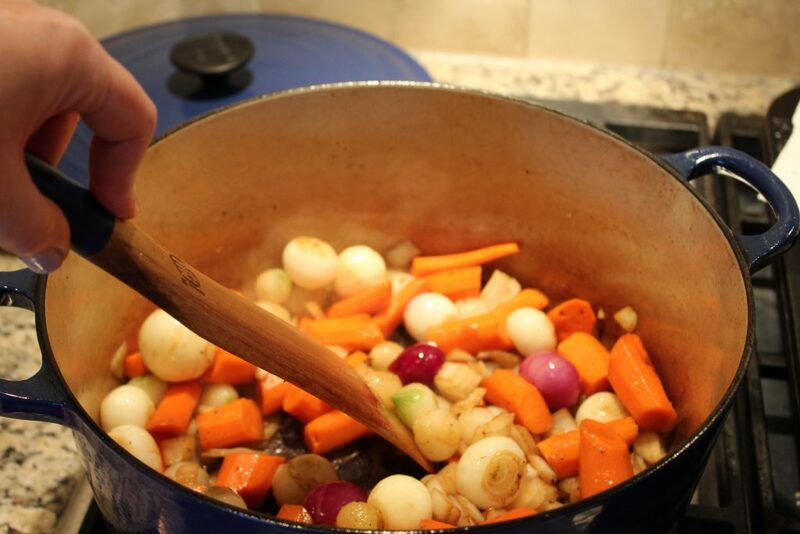 Push the beef and vegetables to the side of the pan to make an area of liquid to add the thickening mixture. Pour in the thickening mixture, stirring to combine. 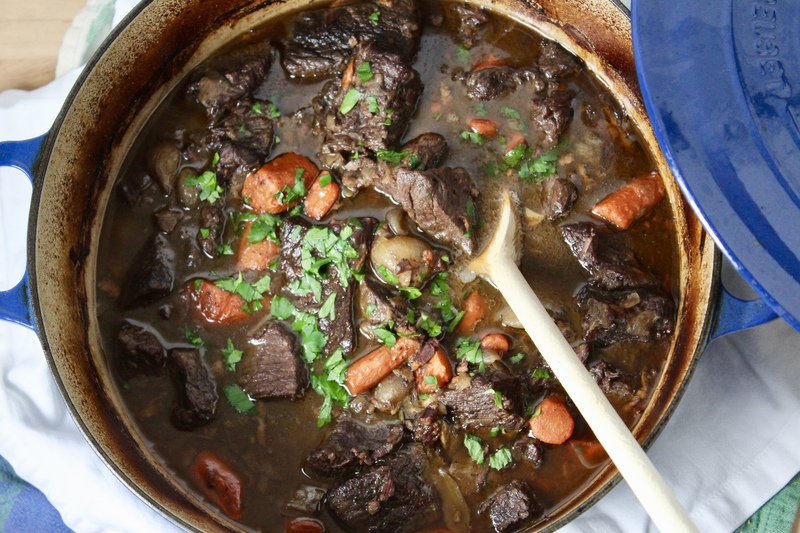 Bring stew to simmer for a minute or two to thicken. Give the stew a taste, add additional salt if needed. Garnish with parsley if desired. *If you don't have kitchen string, you can add the herb sprigs to pot and pick out the stems later or you can strip the leaves off the sprigs and add just them to the pot. I usually serve this stew with mashed potatoes or soft Parmesan polenta. 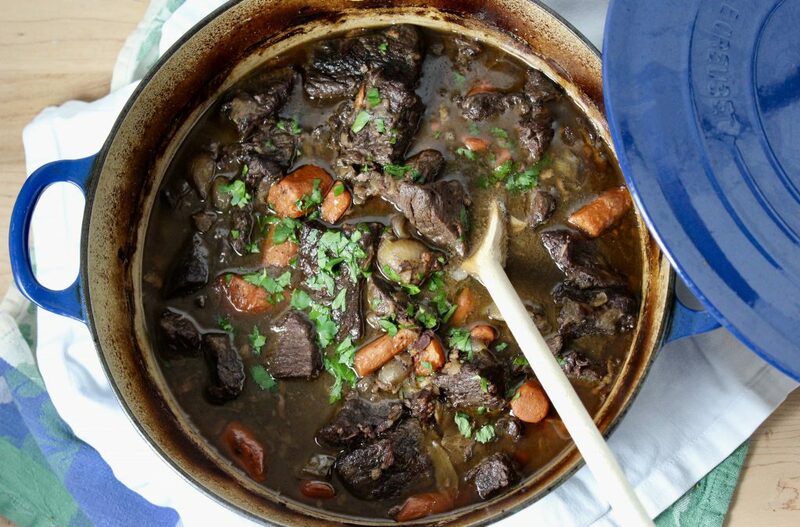 We usually have peas on the side, but you can certainly add them to the stew at the end before thickening. This stew freezes very well. I usually freeze half and can make 2 meals for our family of 4 from one batch. Enjoy Margot! Hope you have a great weekend!